The 9′4″ Fun Stick is the younger sibling of the 9′2″ Sweet Spot. The volume is exactly the same at 140 liters, and the shapes are similar. 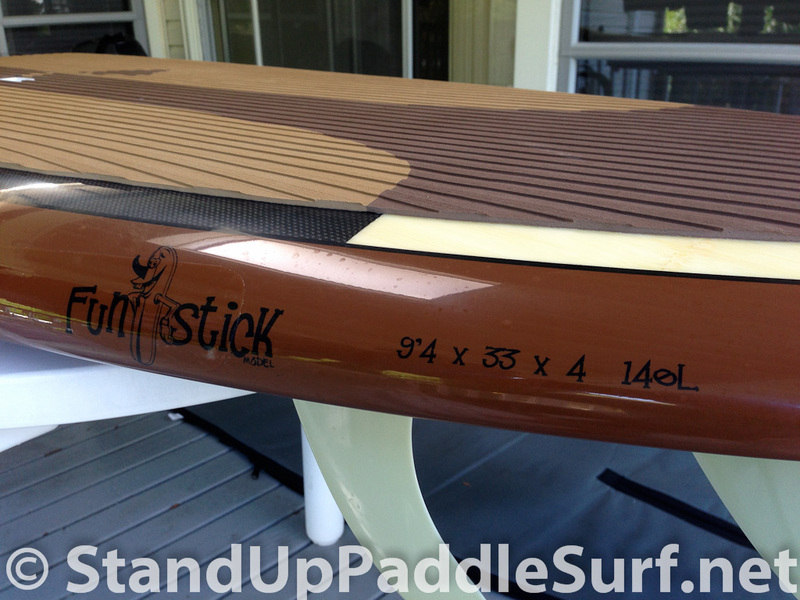 However, the Fun Stick is an inch wider than the Sweet Spot at 33″, and is also two inches longer. 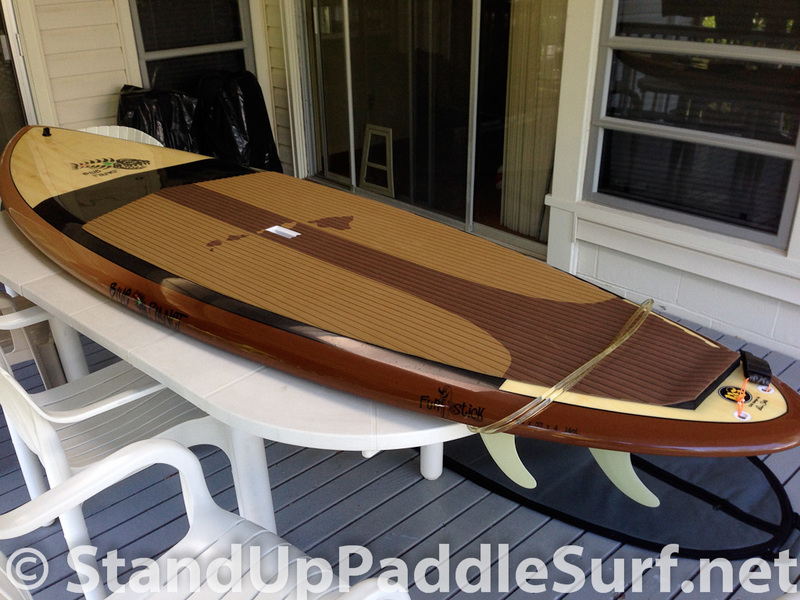 In order to make up for the added length and width while keeping the same volume, the tail and nose are thinned out on the Fun Stick, and the tail is pulled in to keep the board loose and easy to turn. 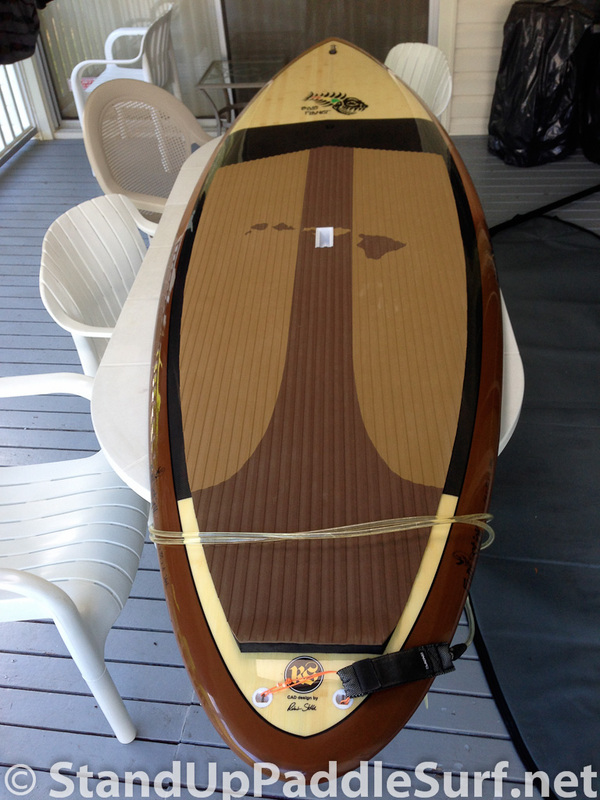 As with all Blue Planet boards, the Fun Stick comes with the deck pad installed, a GoPro plug on the front, a vent plug, carrying handle, and the option of single, tri or quad-fin setups. I’ve been riding the Fun Stick as a quad. 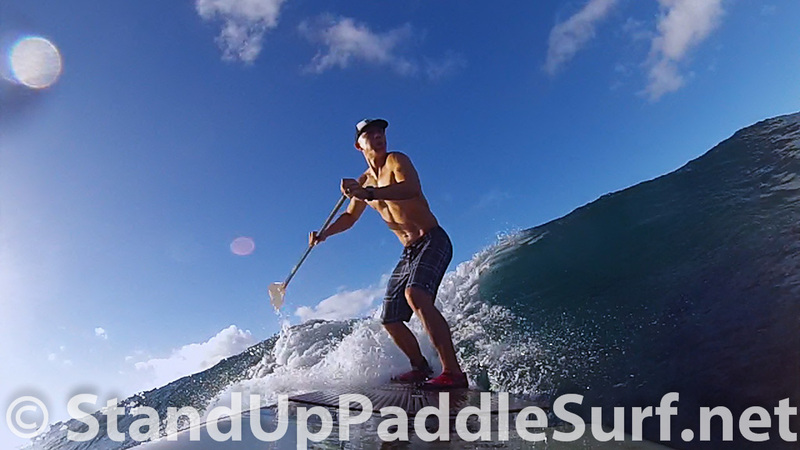 I’ve been able to ride the Fun Stick in a variety of conditions, from glassy calm to windy/choppy. 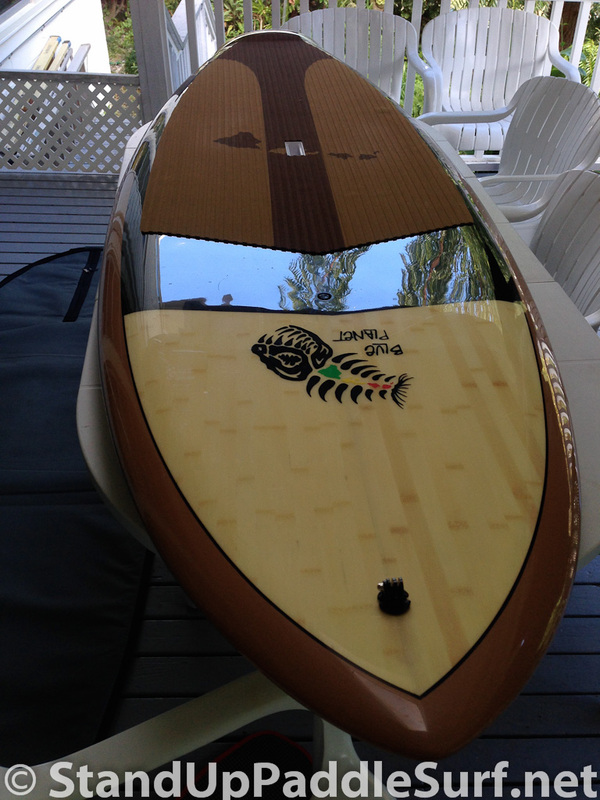 The board handles easily and makes it a contender for an all-around board. It planes nicely, and punches into the wind effectively. You don’t get the nose flying out of the water in windy conditions like you do on some boards. 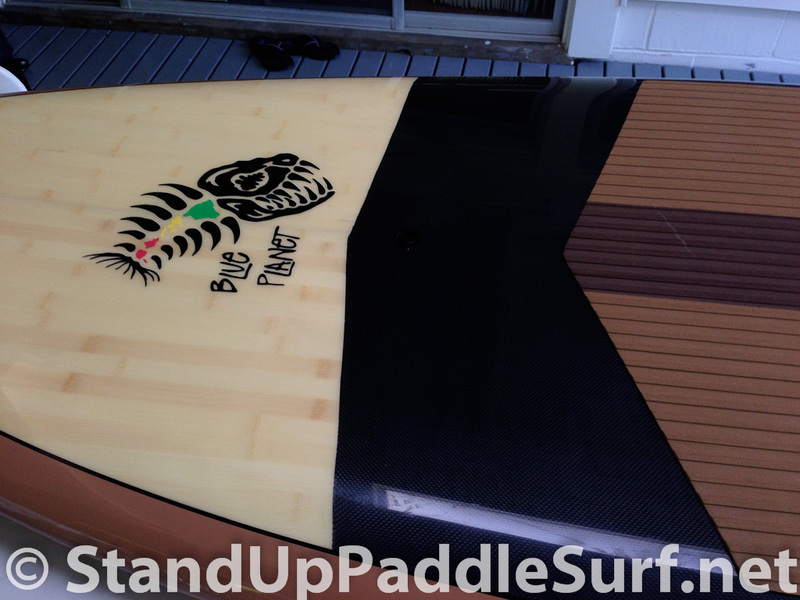 The nose design also helps the board “punch” through the chop. I found the Fun Stick very stable, even in windy conditions, probably due to the 33″ width. In the surf, the board was easy to maneuver, despite my novice/intermediate technique. 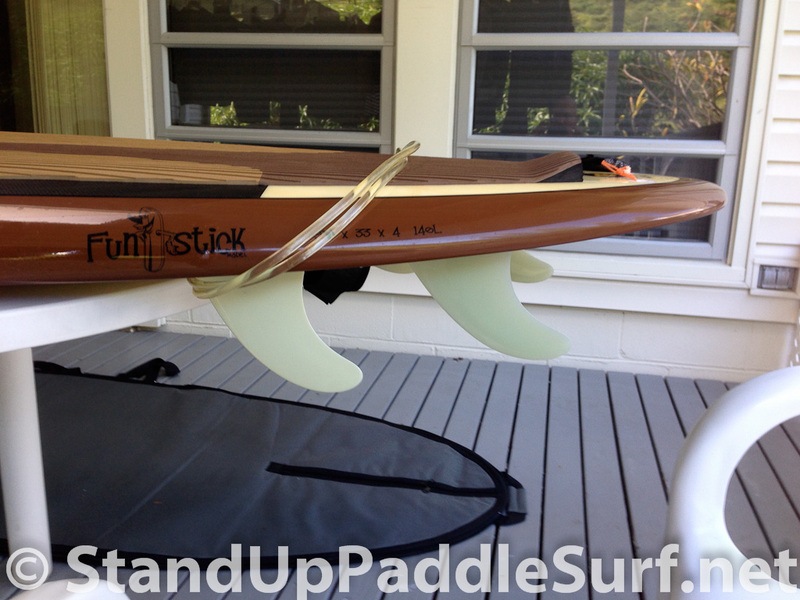 The Fun Stick turns smoothly and responsively, and catches waves very easily. In small surf, it felt like you could make the board catch-up to waves, and then drive forward to get on the face of the wave. The rocker and triangular nose also make is easier to take late drops (which happen for me with some frequency by mistake), and the pulled-in tail make turning on the rails take minimal effort. I’m about 170 pounds, but my friend who is 220 pounds also gave the Fun Stick a try. The board floated him no problem, with lots of room to spare. I was told that 140 liters can hold about 300 pounds, so it was not that surprising that 220 pounds did not have a noticeable effect on how the board was floating and planing. 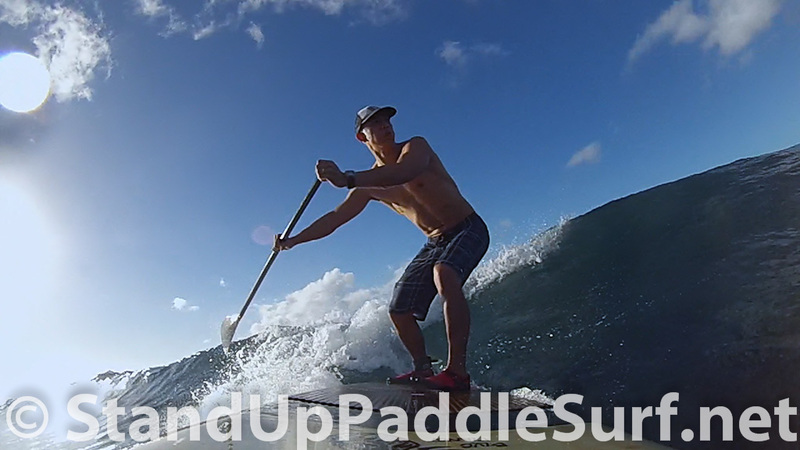 My friend had an easy time paddling the Fun Stick around and catching waves. 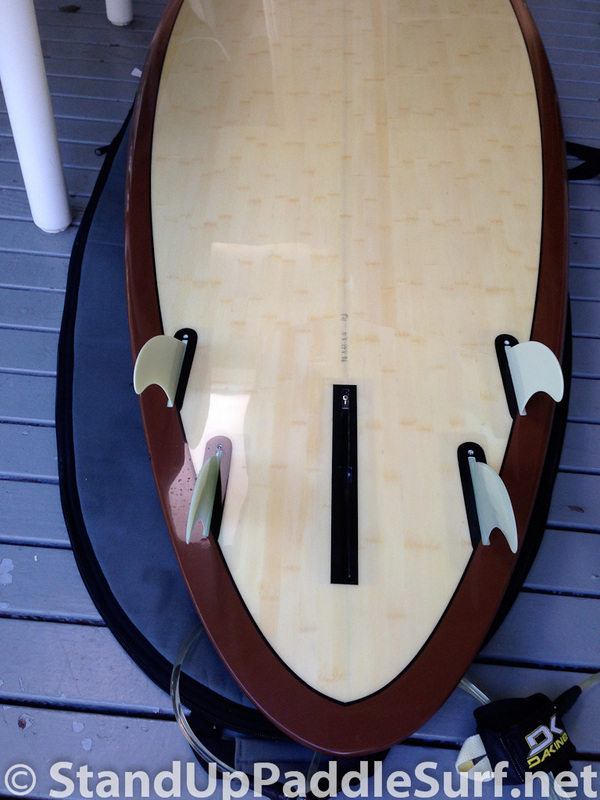 The Fun Stick, like the Sweet Spot, is a great all-around board. 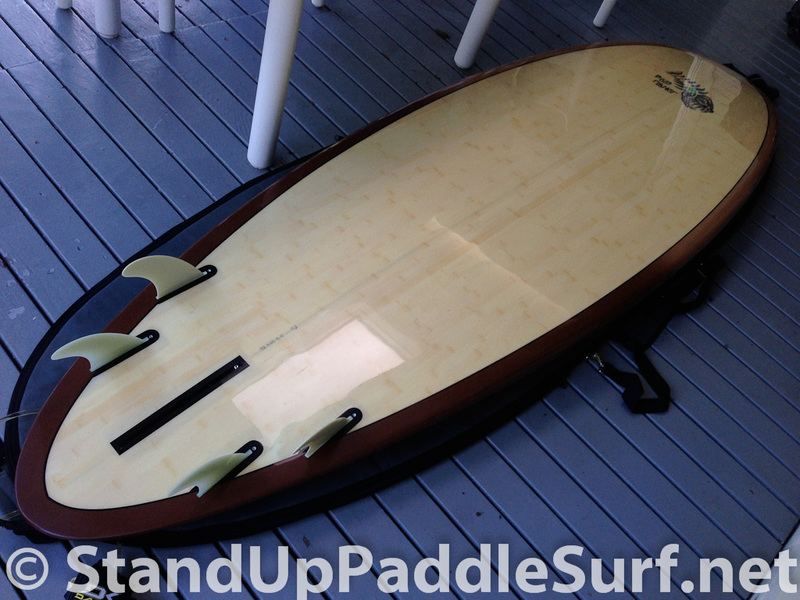 It does well in all conditions (although I’ve never tried it in big surf due to my own ability limitations), is stable, and the tail/nose/rail design make it easy to turn in the waves. 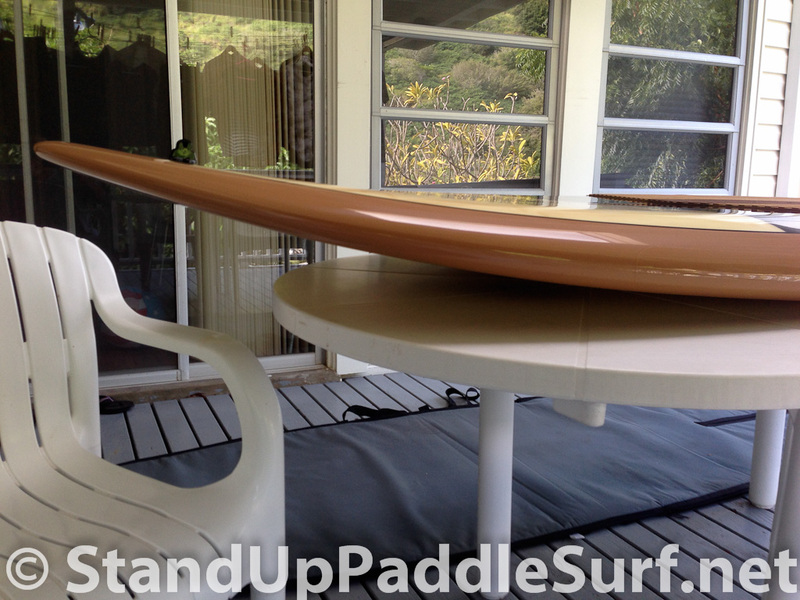 favorite SUP Designer. 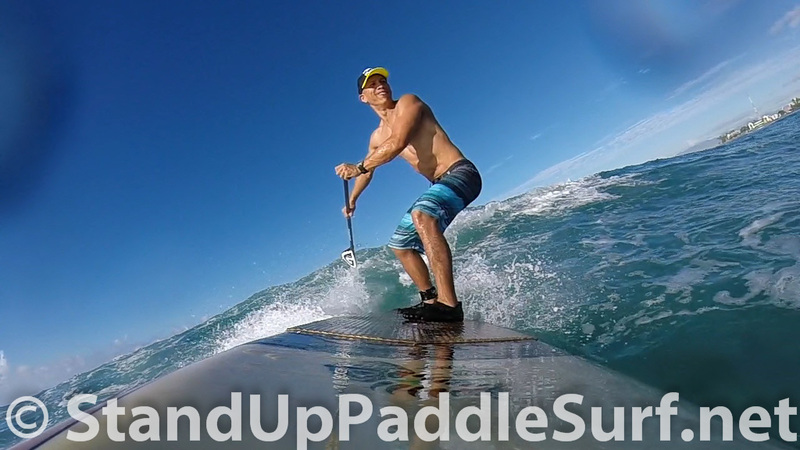 This time, Robert Stephlik (blue planet surf) has proven that his last 2014 Sup Degins cann’t be denide.Whether it’s for light weights,medium weights, or Da Brahdas. 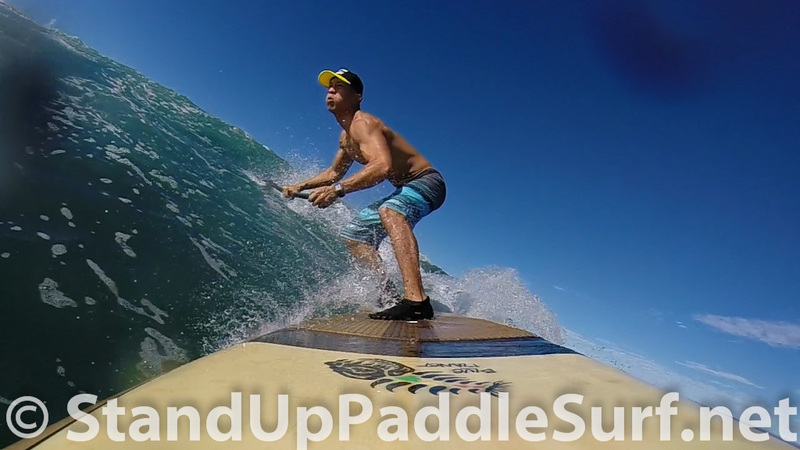 Every Sup is desgined to the ultimate Satifaction. Every dollar spent is well worth it. Got Da EASY Model a month ago as a gift. Having the most “FUN”. Lots of EXTRAS included too. 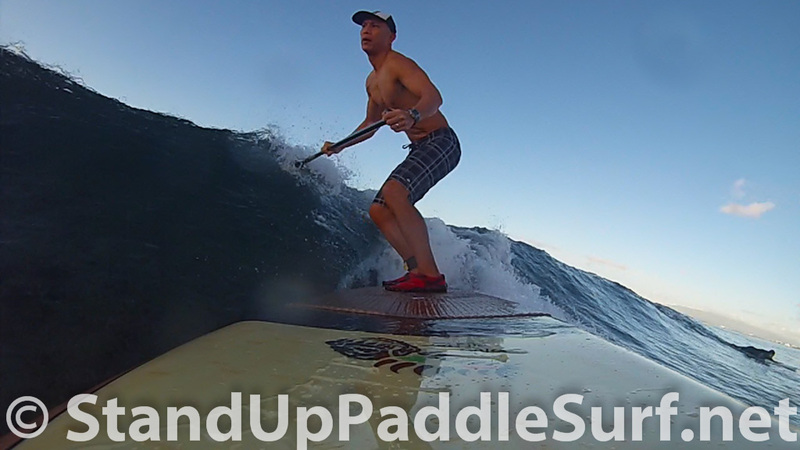 Kevin can match you up with a Sup to fit your needs. 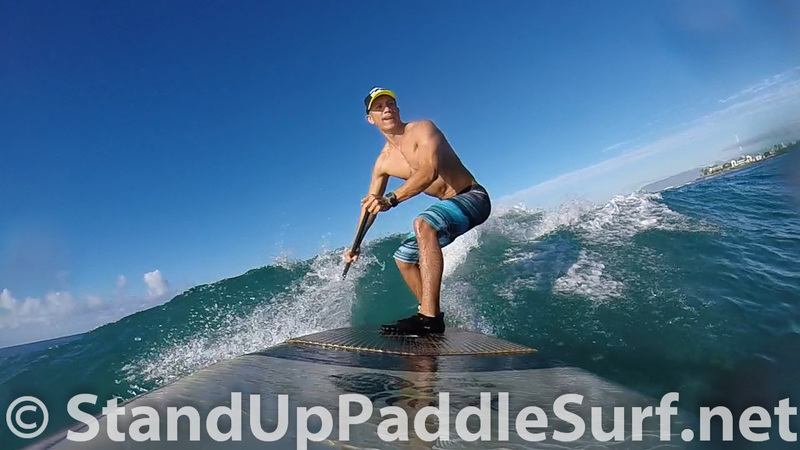 Sups(2014) are going fast. “Check’em” out Soon. Prices are acceptable.